Soil water availability is important for tree growth and varies with topographic position and soil depth. We aim to understand how two co-occurring tree species with distinct rooting and physiological characteristics respond to those two variables during two climatically distinct growing seasons. Growing season (May to September) sap and transpiration fluxes were monitored using heat ratio method sap flow sensors on Populus tremuloides and Picea glauca in 2014 and 2015 growing along a hillslope with two different soil cover depths providing different rooting spaces. Across the two growing seasons, a shallow rooting space was the main factor limiting aspen’s leaf area and cumulative sap flux, whereas responses of white spruce were more limited by topographical position. Generally, sap and transpiration fluxes decreased with the season; however, a large precipitation event during the 2015 summer triggered a significant recovery in sap and transpiration fluxes in white spruce, while in aspen this response was more muted. 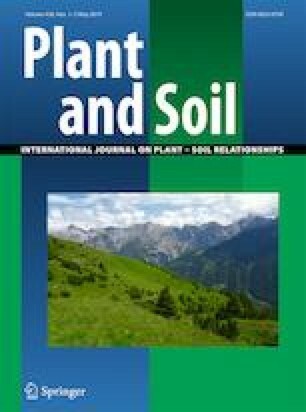 The two species distinct rooting and physiological characteristics produced contrasting water uptake and water use dynamics in response to rooting space, soil water availability and climate, inviting a more detailed exploration of sap flux and its interactions with climatic and edaphic variables. The online version of this article ( https://doi.org/10.1007/s11104-019-04029-6) contains supplementary material, which is available to authorized users. We thank Marty Yarmuch and Craig Farnden for their logistical support and all those who provided field and lab support for this project over the years (Pak Chow, Frances Leishman, Simon Bockstette, Robert Hetmanski, Caren Jones, Jeff Kelly, Angeline Letourneau, Mika Little-Devito, Michelle McCutcheon, Shauna Stack) and data processing support (Newton Tran, ICT International Pty Ltd.). We thank Sean Carey and three anonymous reviewers for their comments on the manuscript. We would like to acknowledge the funding support provided by the National Science and Engineering Research Council (NSERC), the Canadian Oil Sands Innovation Alliance (COSIA, Syncrude Canada Ltd., Canadian Natural Resources Ltd., Suncor Energy, Imperial Oil Ltd.).